We’re traveling today. Between the long lines everywhere and the dismal food selection, I’m not excited about it. Luckily, I saved some goodies from our Greenling box this week so that I don’t need to load up on greasy airport food. I sliced up 2 bell peppers, 2 oranges, a bunch of Oriental turnips (these are fantastic raw! 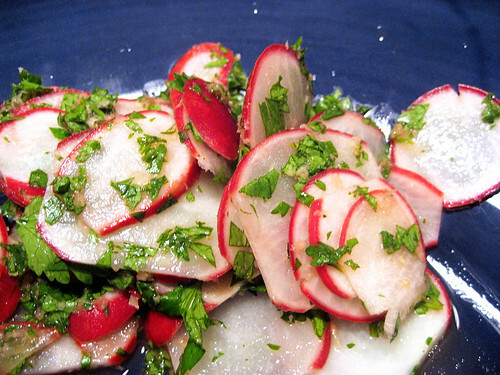 they’ve got a much milder flavor than regular turnips), and a bunch of icicle radishes for the plane. 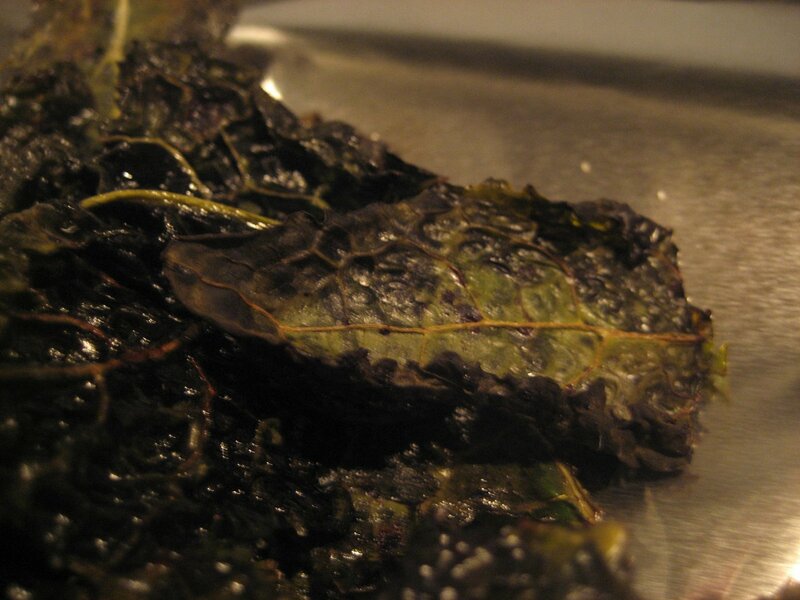 I also baked up a batch of kale chips from the beautiful head of kale that was in our Local Box last week. Hopefully it’ll sustain us for the long flight back home! Before roasting, I toss my kale in some balsamic vinegar. It’s not like most people make kale chips, but I really like the sweetness of the vinegar with the bitterness of the greens. Together with the coarse salt, it creates a really interesting flavor. And given that kale is a nutritional powerhouse, it’s much better for us than other snacks. Chop the kale into 1″ pieces. Discard the pieces with large stems. Toss the kale with the balsamic, olive oil, salt and pepper and arrange them on a cookie sheet so that the pieces are not touching. Bake for ~10 minutes or until the pieces are crispy. This post is a few weeks late and eggplants are no longer in season, so I apologize! But I was so impressed by how quick and tasty this was that I had to share. By now, you’re probably well aware that eggplant is my nemesis. But I keep finding new and delicious ways to use it, between the eggplant croquettes, the eggplant rollatini, and now this curry. It’s rich and has that sticks-to-your-ribs quality that’s usually found in meat-based dishes. It’s also got so many flavors and textures going on, which really surprised me, given that the recipe wasn’t too complex. The original recipe called for palm sugar and kaffir lime leaves, but I subbed brown sugar and lime zest with no problems. I would recommend trying to find fish sauce though. It’s not oyster sauce, which is used in Chinese recipes and is thick and sweet. Instead, it’s quite liquid-y adds a salty, umami-esque component. I had plenty for dinner and leftovers for lunch the following day. But if you’re making this for a larger crowd, I’d double the recipe or add some protein. Chop the eggplants into 1/2″ chunks and set aside. Heat 1/2 of the can of coconut milk over medium-high heat in a skillet. When the mixture starts to simmer, whisk in the curry paste. 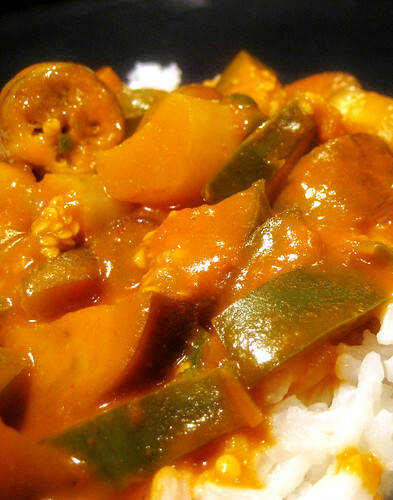 Let the coconut milk-curry mixture reduce by half. When the mixture has reduced, add the remaining 1/2 can of coconut milk, fish sauce, and brown sugar and whisk to combine. Add the eggplant chunks and simmer for ~8 minutes until they’re tender. Add the lime zest and serrano chili and simmer for ~1-2 minutes. Serve immediately over rice. I posted my mom’s baked apples recipe on Twitter a few months ago. It’s pretty standard until you get to the not-so-secret ingredient: diet black cherry soda. Gross, right? It’s okay to think so; the Twitterverse thought so too. But my mom swears by it. Though I try to eat whole foods as much as possible, I’m starting to swear by it too. It doesn’t taste like soda at all; it just tastes like apples. And the pool of soda in the bottom of the pan makes the fruit so tender inside. The best part of the dish? It’s truly a sin-free dessert. It’s an apple, cinnamon, raisins, and some nuts. Perfect for those of us resolving to keep off the pounds over the upcoming holidays! You can adjust the servings as needed for 2 or 20 apples. 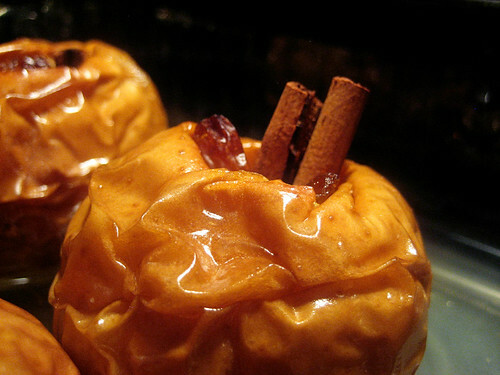 Set the cored apples in a 9×13″ baking pan. Add a cinnamon stick, 1/4 tsp. nutmeg, 1/2 tsp. raisins and 1/2 tsp. 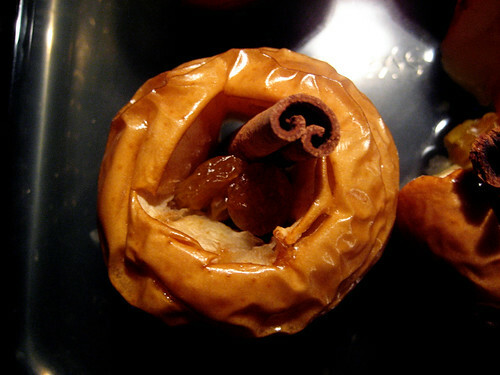 nuts to the center of each apple. Pour the soda over each of the apples, letting it pool in the bottom of the pan. Bake for ~60 minutes, or until the fruit is soft. This is a super easy salad that comes together really quickly. I had it with some grilled chicken, but the bold flavors would complement fish or steak well too. It’s got some bite from the radish, but the cilantro and rice wine vinegar it out nicely. Combine all ingredients and adjust ingredients to taste. Let sit for 30 minutes before serving. Tis the season for greens! We got a beautiful bunch of escarole in our Greenling box last week, and when I think escarole, I think Italian wedding soup. There are so many different ways to make Italian wedding soup and you can really use any greens you want, but I think escarole has the structure to hold up nicely while hot (instead of wilting) and doesn’t overwhelm the other flavors in the soup. These meatballs were tender and the escarole still had firm structure and a nice bite. I’m not sure how I feel about the halved tomatoes though, and next time, I may dice them a bit. Combine the beef, pork, bread crumbs, parsley, parmesan, garlic, oregano, salt, pepper, and egg into a large bowl (hands work well for this). 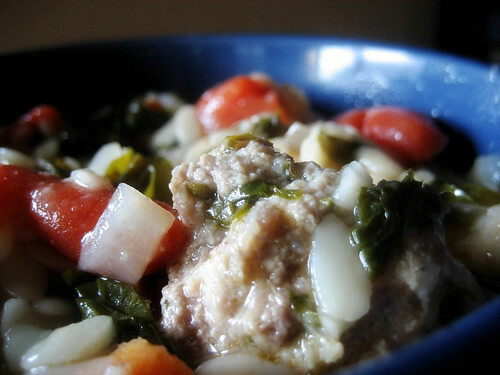 With damp hands, shape the beef mixture into 1″ meatballs and transfer them to a large plate. Cover and refrigerate until ready to cook. Melt the butter in a large soup pot over medium heat. Add the onions, carrots, and celery with salt and pepper to taste and cook until translucent and fragrant, about 4 minutes. Add the garlic and cook for an additional 2 minutes. Stir in broth, tomatoes, and water. Cover and cook 10 minutes over medium heat or until soup comes to a boil. 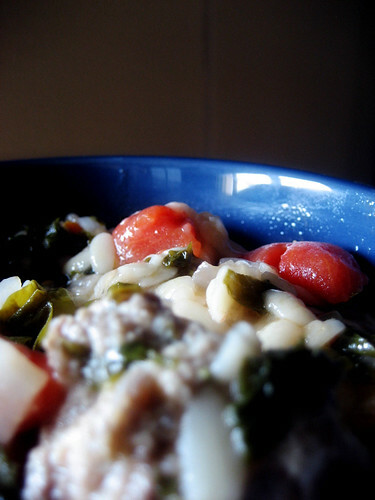 Add the prepared meatballs and orzo to the boiling soup and stir to make sure they are fully submerged. Cover and simmer for another 15 minutes over medium heat. Stir in escarole. Test a meatball to ensure that they are fully cooked. Adjust seasoning if necessary, then serve. The great thing about this dish was that I made it ahead of time and just took it out of the fridge an hour before my guests arrived. 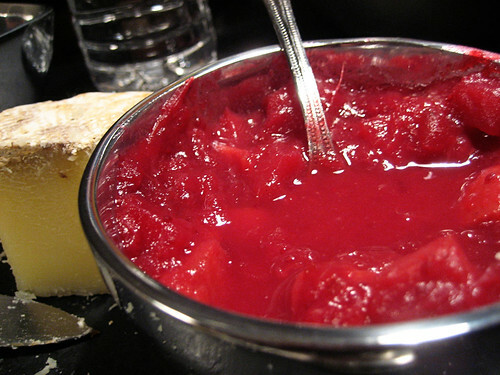 This could definitely take the place of a traditional cranberry sauce, but it’s a bit sweeter and more complex in flavor. I used this recipe (minus the pork part) and left the cinnamon sticks in for the entire simmering process. I also realized that the liquid wasn’t reducing at all after about an hour of simmering, at which point I cranked up the heat and reduced the liquid so that it was the consistency of a chutney. I served this with crackers and a local aged camembert that I got from Humble House at the Pearl Farmers Market. Such an easy recipe that’s great for a weeknight dinner too. 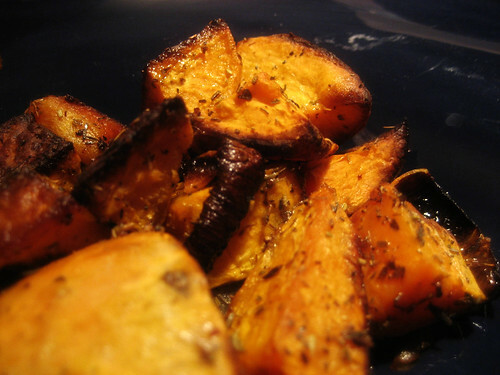 Just cube the potatoes (other root veggies, like turnips or parsnips, would be great here too), toss them in a bit of canola oil and herbs (I like thyme, dried or fresh is fine), spread them out on a baking sheet and roast at 400 degrees for 40 minutes, tossing midway though the cooking time. I like roasting veggies like this because they reheat nicely (so you can make it ahead of time) and it’s so forgiving that it’s not stressful when making it for a large crowd. We also got a huge bunch of rosemary in our box, so I served this appetizer to appropriately highlight it. I actually prepped these the night before and baked them right before guests came, and they turned out really well. I doubled the amount of parmesan (what can I say — I like parmesan! ), so they were doubly salty and cheesy. The bottoms were a bit browner than I would’ve liked (I let them go probably a minute too long), but our guests still loved them. They were great little bites before dinner. 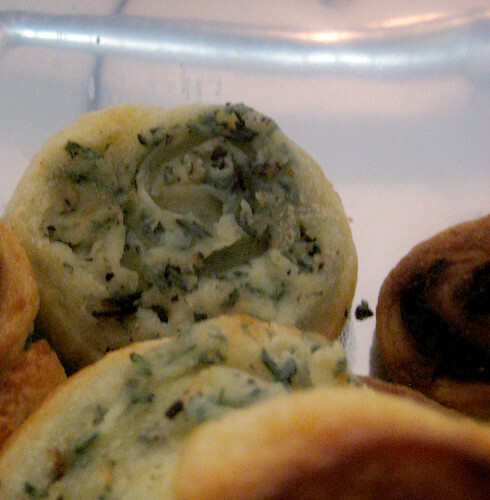 I’m looking forward to experimenting with puff pastry pinwheels using other ingredients (perhaps using sundried tomatoes, other herbs, meats or lox?). Did you make any Thanksgiving recipe with the contents of your Local Box?